On Saturday afternoon, Marvel Studios hosted the headline event in the San Diego Convention Center's Hall H during San Diego Comic Con. Casts and crews from upcoming Marvel Studios films assembled on stage to offer previews of their upcoming films, talk to over 6,000 fans, and break some major announcements regarding the slate of films ahead, including Thor: Ragnarok, Black Panther, and Avengers: Infinity War. The panel starts with a message from Paul Rudd and Ant-Man to tell us everuthing we need to know. "It all starts with Iron Man," Rudd said, before joking about Iron Man's beard. "So, the Hulk, I don't know. I never actually saw the Hulk, so whatever/" They recap Thor and Pena calls him "an alien or whatever." "His dad is like, I'm gonna take that hammer and I'm gonna kick you out of the house!" Pena said. "Steve Rogers, he's not Captain America yet, he's skinny. Like crazy skinny," Rudd said. "Like a, better be funny, kind of skinny!" Pena added. Rudd ttalks about Nick Fury uniting Black Widow, Hawkeye, and the rest of the Avengers to fight everybody's favorite villain Loki. Then, in Iron Man 3, Tony's house gets destroyed. Then, there's Thor: The Dark World and Captain America: The Winter Soldier. Guardians of the Galaxy gets a recap where they joke about how ridiculous it is before the "James Spader robo"t is mentioned. Then, they call Ant-Man the "godfather" of the universe. After that, it's Captain America: Civil War, which Rudd takes Team Cap while Pena takes Team Iron Man. Doctor Strange introduces a magician, Guardians Vol. 2 comes along, then Spider-Man: Homecoming. Michelle Pfeiffer has been hearing the whole story and she'll be playing Janet van Dyne. Concept art and test footage reveals Hank Pym in an Ant-Man costume. A trip to quantum realm. The Wasp, in a yellow suit, in action. A truck shrinks then becomes larger to blow another truck off of the road. The logo plays and Giant-Man peaks out from behind a building at traffic, hiding behind it. Ant-Man and The Wasp casting announcements: Hannah John-Kamen playing The Ghost, Walton Goggins is Sonny Burch, Randall Park is Jimmy Woo, Laurence Fishburne is Dr. Bill Foster! Nick Fury is in Captain Marvel. He has two eyes because according to Marvel Studios president Kevin Feige, it is "set in the early 1990's." "The villains of this will be the first MCU appearance of The Skrulls," Feige said. The cast of Thor: Ragnarok take the stage including Chris Hemsworth, Tom Hiddleston, Mark Ruffalo, Cate Blanchett, Jeff Goldblum, Tessa Thompson, and Karl Urban. "I played this character five times. 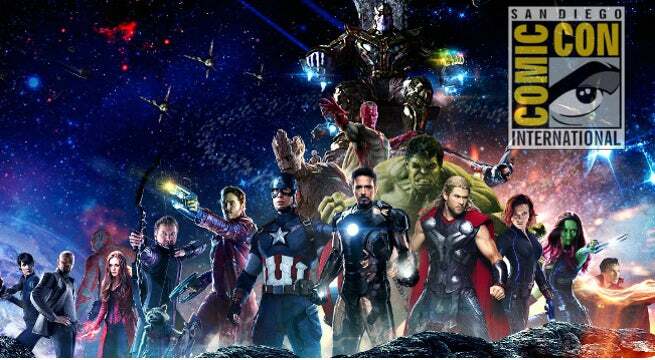 This is Marvel's 167th form or something," Hemsworth said. "All of us agreed, if we're gonna make a third Thor, we have to push the envelope and experiment." The experiments included cutting his hair, changing his hair, and changing his clothes. "It's been four years and if you saw Thor: The Dark World you will know that Loki is on the throne of Asgard pretending to be Odin," Hiddleston said of Loki. "Thor comes home and things are a little different in Asgard. Loki has directed most of his energies into narcissistic [efforts]...Ragnarok is coming...He's still the God of Mischief. What his part is in all of that, you'll just have to wait and see." "It's a little different Hulk than we've seen. Hulk refuses to turn back into Banner and he's actually enjoying his time on Sakaar because he is a gladiator champion of the world of Sakaar which means he kicksa a lot of A!" Ruffalo said. "He's enjoying his life for once and he'll be damned if he's gonna go back to Banner." "He's a little perma-Hulked. He's starting to be able to, because he's been the Hulk for two years now, he has the vocabulary of a two year old so we have a speaking Hulk. Can I say that? We may or may not have a speaking Hulk in Thor 3 where everyone may or may not die." Blanchett calls her involvement in the film a "happy accident." "Yes, I'm the Collector's brother," Goldblum says of his Grandmaster. "The elders are very old!" "We're 'the oldest living race,' they call us in the thing," he said. "I rule on this planet Sakaar and put together games mostly...and fighting games...and I put together, and I don't wanna give anything away, but the great, great match between Hulk and the new Thor." "She is an elite warrior of Asgard who is hanging out on Sakaar for reasons I can't elaborate on," Thompson said of Valkyrie. "She has a relationship with the Grandmaster. It's not romantic. Maybe it used to be. He's a friend from work. She picks up little pieces from around town that happen to be of interest and one of them happens to be a big god-like thing and so she takes him to the Grandmaster..."
Karl Urban was on vacation when he received a call from Waititi asking for help in the film. Rachel House is grateful for the audience's applause. "I've been in four out of five of [Taika Waititi's] films that he's made," House said. "She's awesome," Waititi adds. Footage plays, featuring Taikia Waititi as Korg. Thor is guided through a very mechanical setting, strapped to a chair. A voice tells him no one leaves this place. Sacker surrounds him. “”It is the collection point for all lost and unlike things,” the voice says. “Here on Sakaar, you are significant, you are valuable.” She describes the Grandmaster as his figure flashes by Thor of gladiators in battles. He will meet the Grandmaster in 10 seconds. Thor screams as the visuals overwhelm him. They disappear and he is presented to the Grandmaster. Valkyrie confirms it is “a he.” Grandmaster compliments Valkyrie but a woman standing on the other side of him belittles her rather than finishing his sentence calling her the “best.” Valkyrie tells Grandmaster Thor is a “contender.” Grandmaster is pushed closer to him. Colorful guards stand behind Thor. Valkyrie is paid but Thor insists he is not for sale. He rips out of the chair but a taser implanted in his neck takes him down. The units are transferred to Valkyrie and she leaves. Topaz is ordered to make Thor feel welcome. Thor is tossed into a holding area. Korg is there, eager to introduce himself to Thor. Thor has questions. They would in circles. Thor quickly realizes he is behind Korg after only a moment. Kong tells him this is a “freaky circle” not a “full circle.” Kong says he is made of “perishable rock.” Thor is ready to fight his way out. The cast of Black Panther takes the stage. "I couldn't talk about it. It was a big secret. It was just good to share bits and pieces of it," Chadwick Boseman said. "He's returning from the events of Civil War, so he's lost his father. He's just learning how to deal with becoming a new ruler. He's still mourning his father's death. It's a transition period that gets interrupted very quickly." He is struggling to decide what kind of king he wants to be. "This comic book, in particular...it means everything to me," director Ryan Coogler said. "I grew up loving comic books. It didn't matter what color the comic book character was...as I got older, I wanted to find a comic book character who looked like me. I asked the comic book shop owner if they had any...To be here at Comic Con to share it with you guys is amazing, man." "I thought the best thing about the comic book was that T'Challa was somebody who got his power from the people around him," Coogler said. "That's really the cool thing I'm excited to bring about this." "Shuri is T'Challa's younger sister and she is like the technological wiz of Wakanda. She designs all the new technology.She's a scientists. She was like a dream role to play. Inspirational. Innovative. Just a strong black woman," Letitia Wright said. "Not just a black woman but a woman and it was just beautiful to play that." "It definitely was a new process," Okoye actress Danai Gurira said of her training for the role. "She works with a whole different weapon. There are some overlaps but not alot," she said, comparing the role to The Walking Dead's Michonne. "The fact that she is really protecting that and that's what drives her weaponry...It's all driven by love of her people and what her forefathers and foremothers put in place." Michael B. Jordan thanks the fans before talking. "I feel like Erik has his own point of view and opinions on Wakanda and how it should be ruled," Jordan said. "He has his eyes on the throne. He's trying to do whatever it takes to get into Wakanda and make that a reality." Forest Whitaker is excited for his first Comic Con. "He's been working as a spiritual leader who was very close friends with [T'Challa's] father," Whitaker said. "He's trying to give him advice that would mold him into being king. Following the lineage of kings and advisors to kings, he has that relationship with T'Challa." "He's T'Challa's oldest friend," Wakabi actor Daniel Kaluuya said of his role. "He sees a side of what's coming into Wakanda." "We did loads of stunt training and everyone had their own different fight styles and there was a drummer that was matching our movements." "Nakiya is a spy and she goes undercover to the rest of the world and reports back to Wakanda about the goings on," Lupita N'yongo said. "They have to send people like Nakiya out there, known as war dogs," to keep Wakanda safe. "I get to wear pants in this movie and secondly, I get an arm back. I get my arm back which is pretty cool. Ulysses is a wheeler, dealer. He's a lone wolf but he can pick up the phone to every government and compromise them," Andy Serkis said. "It was really amazing working on this set because I think Ryan Coogler is the most incredible director and human being. This wonderful beautiful guy on set where everyone was able to operate at their maximum." A clip of Klaw rolling into a casino with an entourage plays. He meets Everett Ross. He says they are just here to gamble. He pulls Vibranium out of his pants to hand it over. The Dora Milaje observe it.Security approach Okoye and she fights them with a staff, flipping her wig off and tossing one over a railing. Klaw opens fire on Ross who blocks with a briefcase. T'Challa springs into action. The Dora Milaje handle additional security. Klawe runs out of ammo as he is aiming at T'Challa. His arm turns into a cannon and he fires at him.